Being ardent Ranbir Kapoor fans, it would have been criminal to not dedicate a post on him on our blog. 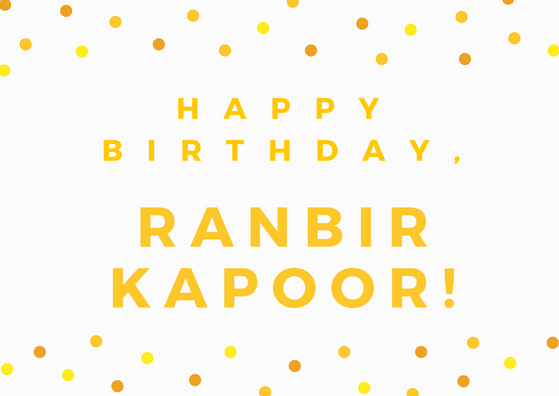 And the time for dedicating a blog post to him couldn't have been better - he turns 34 today and we are going to share our top 5 RK movies, so bring your chai/coffee out and stay put. One cannot help but notice the way Ranbir Kapoor owns every character that he plays. Known for his unique choices in the selection of roles that he has played so far, he might have seen the highs and lows of his stardom/career but his talent has never been questioned and rightly so. Even in the underrated films like Bombay Velvet, whereby he plays the character of Johnny Balraj, a street fighter/boxer with ultimate finesse and Roy, a movie based on a rather weak plot with a lot of loopholes, he plays the twisted character of Roy in a way that does not fail to catch the viewers' attention. Read on to know about our favourite movies and the characters played by the extremely talented superstar of our generation, Ranbir Kapoor. P.S. The movies are in no particular order of preference. 1. Barfi - Murphy 'Barfi' Johnson, a fun-loving chap who is a troublemaker and always on the radar of a local cop Sudhanshu Dutta made us laugh and cry at the same time by his rib-tickling antics. Despite being deaf and mute, he doesn't want you to sympathise with him and in fact, wants you to join him in his escapades. Ranbir, yet again after the thumping success of Rockstar, delivered the performance of a lifetime in this movie, making it is hard to imagine anyone else play that character, outdoing him. 2. Rockstar - Janardhan Jhakhar (Jordan), a budding musician who was called a 'halka aadmi' by the canteen guy in his university (who later went on to become his manager) as he felt Janardhan have not been through the pain that the other famous musicians in order to become successful. At a later stage, Janardhan falls in love with the hottest girl (played by Nargis Fakhri) in his University who gives him the identity of Jordan/JJ and he goes on to become a 'Rockstar'. However, the story is not as simple as it appears. The movie revolves on all the different stages of his life and career- from being a shy and unappreciated guy facing "social drama" and becoming homeless to a celebrated singer to spirituslism "jab jagg mein kuch nahi bhi nahi tha, wohi tha, wohi tha.. wo jo mujh mein samaya wo jo tujh mein samaya, maula wohi, wohi maaya" and eventually reaching the heights of success. But, with success alone does not come peace of mind as he struggles with his"kaahlipann" (emptiness). Jordan is the mouthpiece of our suppressed emotions"Mitti jese sapne ye jitna bhi palko'n se jhaaro phir aa jatay hein" , voice of the rebel, and the perfect depiction of Man VS. Society, "Tum logo ki is duniya mein har taraf insaan hai ghalat.. mein sahi samajh k jo bhi kerta hoon, tum kehte ho ghalat.. Saadaa haqq aithay rakh!" The music of this movie is phenomenal and raises the bar higher. The compositions do justice to the lyrics and carry the narrative forward. "Jo bhi mein kehna chaahun barbaad karein alfaaz meray.. Mein bhi tou bhi sabhi hain sheeshay, khudi ko hum sabhi mein dekhein.. Kabhi mujhe lagay k jese saara he ye jahaan hai jaadu, fizza, ghatta, hawa, bahaarein.. mjhe karein isharay ye.. kese kahun kahaani mein in ki". Not only the writer of the movie, Imtiaz Ali deserves credit for the depth that the character of Jordan exhibits but the way it has been executed by RK gives it a timeless appeal. Like Barfi, Rockstar also earned Ranbir a lot of critical acclaim besides commercial success. He walked away with almost every major best actor trophy for his act! 3. Tamasha captures Ved Sahni's journey from not being able to chase his dreams due to parental pressure and eventually losing his edge while not being able to conform to the societal norms and fit into the role of a "regular" guy/ "hero", who works as a Project Manager in a firm. The very tagline of the movie, "why always the same story?" questions the monotonous to the extent of being lethal lives that we lead, perhaps, because of "log kya kahein gy". The shades of Ved's character, Ranbir's flawless expressions as he breathes life into the character by displaying a whirlpool of emotions and his chemistry with the lead actress, Deepika Padukone are hard to miss. Every time an introspect like us would watch this movie, he'd see it from a new perspective. It would not be wrong to say that 'Tamasha' is an ode to the theatre as an art form and a metaphorical representation of the 'Tamasha' within and around each of us as we lead our lives struggling between who we are 'supposed' to be and who we are or want to be. "Tou koi aur hai, jaanta nahin.. saamne is jahaan k ik niqaab hai". The best part is that it is a journey towards self-discovery but it depicts all the different stages of the process of self-realisation in a realistic way as it does not happen overnight or by a chance encounter with a girl only as he accepts it not after realising it himself after having denied it. "Tujhe tou pyaar ho gya hai pagli.. par kisi aur se", that is, his other self. So, to those who think it's merely a tale of a girl giving a sense of identity to a guy we'd rather suggest, go watch it again with eyes open wide because the movie offers much more than that. Ranbir is at his best in the scenes where he enacts his dual personality. 4. Wake Up Sid chronicles the journey of Siddharth Mehra (Sid) from a high school brat to the recognition of his inner potential as he enters professional life after meeting Aisha Bannerjee, a mature and independent girl who comes to Bombay to start off her career as a writer and becomes his best friend and love interest in a rather unconventional way. Sid is the voice of every desi (Pakistani/Indian) teenager. Even if you've passed the teenage, (like us.. *sigh*) the charm of this carefree yet endearing guy is inescapable. 5. Yeh Jawaani Hai Deewani (Samra's choice) - It was one of the highest grossing films of Bollywood features Ranbir Kapoor as Kabir Thapar (Bunny), a self-obsessed flirt who believes in the no strings attached theory in relationships and does not want an average life with "22 tak parhai, 25 pe naukri, 26 pe chokri, 30 pe buchay, 60 pe retirement aur phir... maut ka intezaar" for himself. The dilemma with many of us, isn't it? No matter how carefree Bunny appears, he is quite serious when it comes to following his dreams of traveling the world like a gypsie but whether he feels content while traveling the world all by himself or sees "ek ticket mein do mazay" is what you have to watch it out for. Besides, the chemistry of the lead cast and the supporting characters makes it all the more realistic and entertaining. 5. Rocket Singh Salesman of the Year (Deepika's choice) - At an early stage of his career, only a visionary like Ranbir Kapoor who sees beyond commercial cinema and yearns to play a different character every time could take the risk of playing the character Harpeet Singh Bedi, an ambitious salesman who is ambitious yet polite and expresses his intention in a few simple words, "Risk toh Spiderman ko bhi lena padta hai ... main toh phir bhi salesman hoon". The film tanked at the box office but was yet touted as one of his best performance to date. Join us in the movie marathon by watching these movies and Ae Dil Hai Mushkil's OST and teasers all over again and do not forget to share your favourite performances of this coming of age actor, the one and only, Ranbir Kapoor.